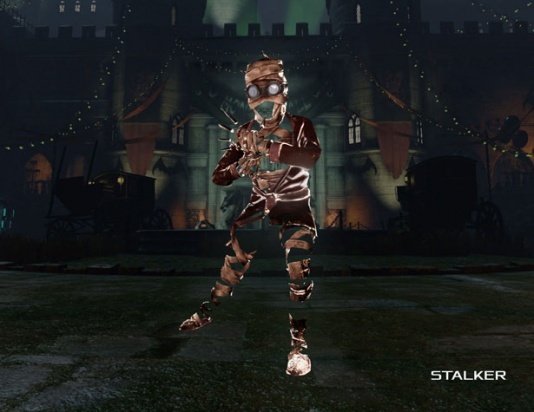 The Stalker is a common specimen in Killing Floor 2. It is classified as a lesser enemy, and therefore, cannon fodder. Stalkers are unique in that they possess a cloaking device which renders them nigh-invisible to players (except Commandos, who can see and call them out). Stalkers move slowly when docile, and sprint when enraged. On higher difficulties, Stalkers have a chance to enrage upon sighting the players, and have a chance to enrage when shot. Should sprint if can sprint OR (if can sprint when damaged AND damaged) (i.e. if sprint chance met its value) AND if distance to player laying between 6 and 12 meters (600 units < distance < 1200 units). Should sprint when frustrated. Stalkers have resistances to some forms of damage types, and do not have any weaknesses to damage types. Stalkers have minor resistances to certain ballistic weaponry and are extremely vulnerable to assault rifles. Stalker only have one weak spot, which is the head. The Stalker is an ambush-based, melee-only ZED. Upon spawning, it will walk or sprint towards the nearest player and attempt to attack them. Stalkers tend to spawn from unusual locations such as ventilation shafts, high ceilings or open manholes. This allows them to attack from multiple angles and slip past defenses undetected. Stalkers also tend to use their invisibility to sneak past front lines and attack players in the back more often. Stalkers have the ability to dodge gunfire. When shot at, Stalkers will quickly backflip to the left or the right, or jump backwards to approach from another angle. On Suicidal and Hell On Earth, Stalkers will always dodge when shot at. On Suicidal and Hell On Earth, Stalkers gain a huge boost in movement speed, as well as new attack animations that they will use when enraged. They easily become the fastest ZEDs in the game, only beaten by the bosses themselves in speed. On Suicidal and Hell On Earth, Stalkers will begin to use more acrobatic attack animations, such as drop kicks and axe kicks, making their heads harder to hit once they get into attacking range. Unlike the other ZEDs, Stalkers are able to teleport regardless from amount of the remaining AIs, while for other lesser ZEDs teleportation being completely disabled when less than 12 ZEDs remain throughout the wave. (PvP) Rally boost: forces AI Stalkers to sprint, players do x1.2 more damage. Damage to doors (possible values) = 9 / 27. Stalker has a chance to evade upon taking damage. Stalker has a chance to evade certain damage sources. Chance to evade after taking damage: Normal - 0.1, Hard - 0.4, Suicidal - 1, HOE - 1. Health loss percentage to trigger evade: all difficulties - 0.01. Once hit in the head (at least 1 piece of skull chunk lost) Stalker will lose its ability to cloak. When shot Stalker will re-cloak, after 0.35 seconds, if weapon featuring Melee hit power - after 1 second. Stalkers are extremely fragile. just about any form of weaponry will take them out very quickly. Stalkers are invisible to all players except the Commando. The Commando is able to see Stalkers as a red silhouette that glows no matter what the lighting condition is. Other players will also be able to see Stalkers that the Commando is able to see, depending on the level of the Commando (2m to 50m distance). Stalkers only break invisibility to attack or when shot. They can be seen as a faint, shimmering outline when they are invisible when the team does not have a Commando. A less reliable way to find Stalkers is to look for them among groups of Crawlers, as Stalkers and Crawlers tend to spawn together in the same spots, though this isn't always the case. Stalkers are more unpredictable. If the Stalker sustains a non-fatal headshot, it will lose the ability to cloak. Ammunition can be saved in early waves by switching to the knife and cutting their heads off, though this is significantly more difficult compared to Clots, given their acrobatic attack animations. They also output significantly more damage, making knifing them a lot riskier, plus they are invisible, thus it is harder to see and anticipate their approach. Extremely weak to Assault Rifles, making the Commando the best perk for quickly exterminating huge groups of Stalkers at a distance. Commandos are also the most likely to kill them as they can see cloaked Stalkers the best. Be careful when throwing grenades or using explosives without a Commando on the team, as Stalkers can show up in front of you and block grenades, causing them to drop at your feet, and block explosives from going off entirely as the projectile connects with them within the arming safety distance. This page was last edited on 7 April 2019, at 17:43.